« Travel Attire – Making good choices might improve your flight experience! I am deadly serious here – if you are traveling to Calgary for business or pleasure, stay away from the Deerfoot Trail between 4 and 6:30 PM, and in the morning between 7 and 8:30. Otherwise, be prepared to exercise your FAR side of patience, and watch as your expensive gasoline goes up in smoke. Really! If you actually rocket up to 30 km/hr, you’ll be grateful for the action. 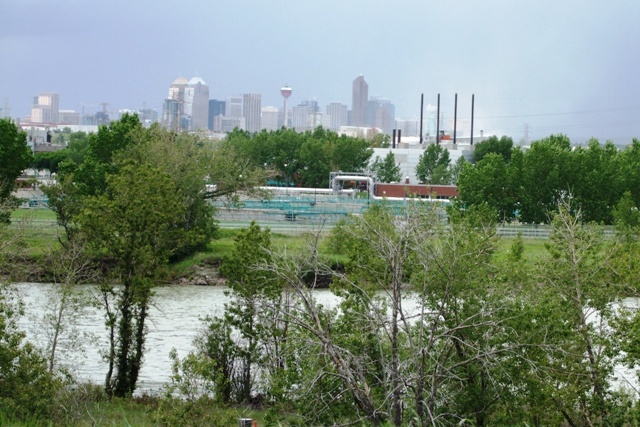 The Deerfoot is the major roadway coming from the north (Edmonton, Red Deer, Airdrie) and it runs right around to the southern edge of Calgary. 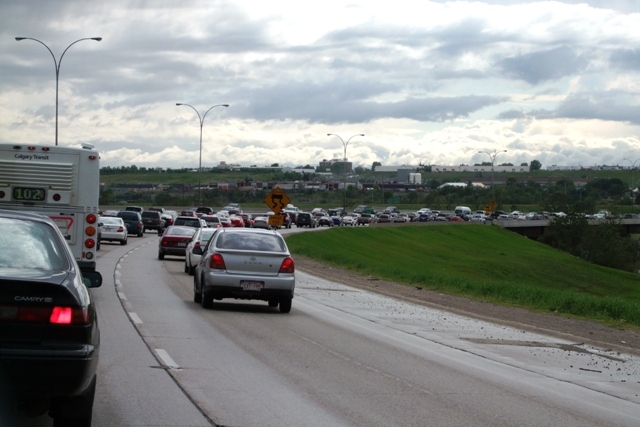 There are many major arteries running off the Deerfoot – if you arrive in the late afternoon, choose one of those major roadways, and get off the Deerfoot, or be prepared for major agitation. Cars, cars, and more cars – that’s all you’ll see for as far as you can see. If you get lucky, you might catch a fast lane up the side until you discover you are in a “must turn” lane, and you’ll have to fight your way back into the pack if you wish to continue your trek forward. We managed to get to our final destination, deep on the south side of Calgary, nearly an hour and a half after we had reached the city’s edge. 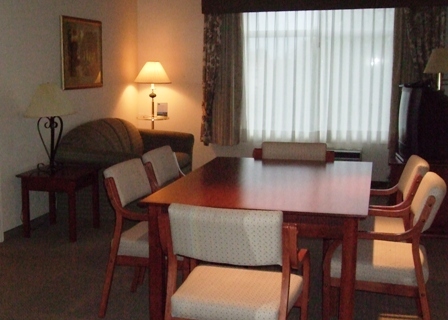 By the way, if you are looking for a great place to stay, try this 7-year old hotel: Wingate Inn on Midpark Way. It’s a little tough to find (special thanks to our Calgarian friends, Kathy and Doug for leading the way), but it’s truly a great place to stay, especially if you like to stretch out. And the free breakfast is very satisfying. But back to the atrocious Calgary traffic jams during rush hours. You’d think we’d learn, wouldn’t you? But there we were, heading out of Calgary at 5:30 at night. Did we stop and bide our time, and wait till the traffic abated? Of course not. We figured we’d give it a go. Well, within only a few minutes on the dreaded Deerfoot Trail, we realized the error we had made – again. We pulled off on McKnight Blvd. and made our way back to Centre Street. It proved to be our first good decision. Our second was stopping for supper at a wonderful Indian restaurant, The Curry House, at 2101 Centre Street. We ate a hearty supper of beef curry for my husband and lamb curry for me, along with golden saffron rice, and freshly baked naan bread spread with fresh garlic soaked in lime juice. Supper was delicious. And affordable. However, like European restaurants, nothing is free – everything is an add-on. But the food is worth the cost. The naan bread is astonishing. It was now nearly 7 PM, but this time when we hit the Deerfoot Trail heading north, it was clear sailing. Traffic was still heavy, but it was moving freely. In the future, we will either avoid the Deerfoot, or we will pull over and have a meal. We’ll leave the Deerfoot delights to the locals. 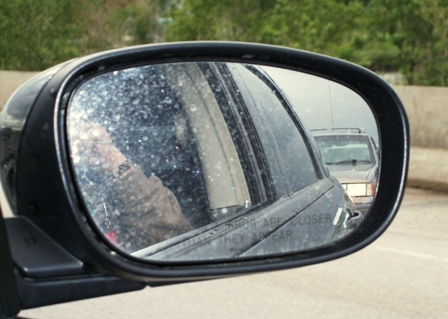 Do you have tips for traversing Edmonton or Calgary streets in rush hour? Please share them here. Here is a good Calgary map site. This entry was posted on Wednesday, June 11th, 2008 at 12:11 pm and is filed under Adventure Travel, Alberta, Canada, Family Vacations, Travel - General Advice, Travel Destinations, Travel safety, Travel with kids. You can follow any responses to this entry through the RSS 2.0 feed. Responses are currently closed, but you can trackback from your own site.